Daimler AG accelerated a management transition, appointing development head Ola Kallenius to replace CEO Dieter Zetsche ahead of schedule as the German carmaker confronts jarring changes in the automotive industry. Kallenius, the first non-German to take the helm of Daimler, will become CEO in 2019. The 49-year-old Swede already was the heir apparent to long-serving Zetsche, 65, who has faced increasing headwinds this year with the adoption of new emissions tests, a German probe into Mercedes diesel engines and growing trade barriers among key sales regions. The transition at the top comes at a critical time for the world’s biggest maker of luxury cars and commercial vehicles. Daimler in June was first among global auto producers to cut annual targets, faced with unpredictable fallout from trade tensions and pricing pressures on top of unprecedented spending on electric vehicles. The company also has been working on an overhaul that will split Daimler into three separate units — cars, trucks and mobility services. The new structure is meant to give the CEO more flexibility to make decisions. “In view of the challenges presented by the transformation of the automotive industry, the supervisory board intends to prepare a suitable succession at an early stage,” the company said. Daimler traded 1% lower at 54.17 euros as of 12:52 p.m., Sept. 25 in Frankfurt, after falling as much as 2.4% earlier. Mercedes-Benz took the luxury sales lead from BMW in 2016, but Daimler also has come under scrutiny over how it tweaked diesel-engine setups to meet emissions regulations, sparking investigations in the U.S. and Germany. Kallenius “seems like a logical solution” after successfully holding key management positions, said Sven Diermeier, a Frankfurt analyst at Independent Research GmbH. Kallenius joined Daimler in 1993 after studying management and finance in Sweden and Switzerland. After stints in Mercedes’s U.S. plant in Alabama, he developed a track record in performance cars, heading operations at McLaren Automotive and then running Mercedes’s performance division AMG from 2010 to 2013. Unlike past Daimler CEOs, Kallenius hasn’t spent time in the trucks unit. The Stuttgart-based manufacturer’s planned restructuring may pave the way for a partial listing of the division. “Kallenius can certainly ‘sell’ a new era better than alternative candidates could have,” said Juergen Pieper, a Frankfurt-based analyst at Bankhaus Metzler. The long-standing claim across the German auto industry that the CEO always has to be a engineer is “too simple in these revolutionary times with so many technological challenges,” he said. 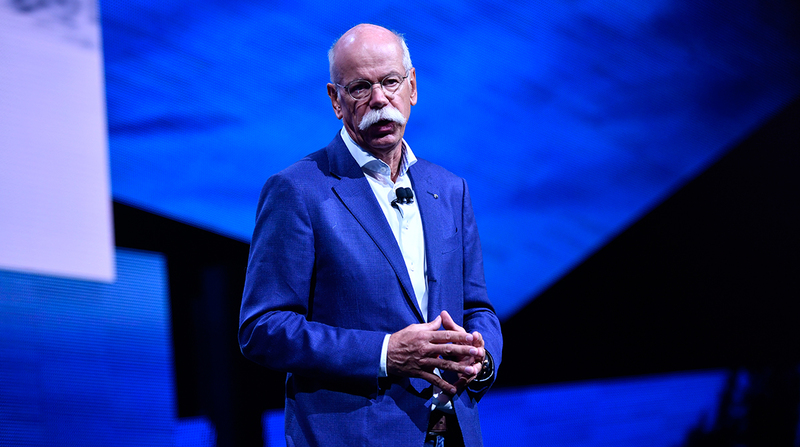 During his 12 years in charge, Zetsche — known as Dr. Z and easily recognizable by his trademark walrus mustache — has left an indelible mark on the German corporate icon. He rose to prominence as the man who tried to turn around Chrysler after predecessor Juergen Schrempp’s efforts to create a global auto giant. But DaimlerChrysler never overcame the cultural differences that plagued cooperation between the companies. In the end, Zetsche cut ties, ceding the remaining holding just before Chrysler filed for bankruptcy in 2009. Chrysler then went on to combine with Italy’s Fiat. Zetsche also ended Daimler’s ambitions in aviation, selling its remaining 7.5% stake in EADS, the predecessor of Airbus SE, in 2013, raising money to invest in Daimler’s auto business. Zetsche’s crowning achievement came in 2016 when Mercedes once again became the world’s best-selling luxury-car brand, a title defended ever since. The push to beat archrival BMW for the first time in more than a decade looked doomed just a few years earlier, prompting Daimler to cut short a contract extension to three years instead of the customary five. “Dieter is rightly admired across the automotive industry for his stewardship of Daimler and the successful evolution of the Mercedes-Benz brand,” said Carlos Ghosn, the auto executive who built the three-way union of Renault SA, Nissan Motor Co. and Mitsubishi Motors Corp.